Discussion in 'Conspiracy Theories' started by Trailblazer, Feb 25, 2019. A photo of cut-down trees on a residential street is being circulated on social media along with the claim that the trees are being removed because they block 5G signals. Usually the photo is being described as coming from Holland. 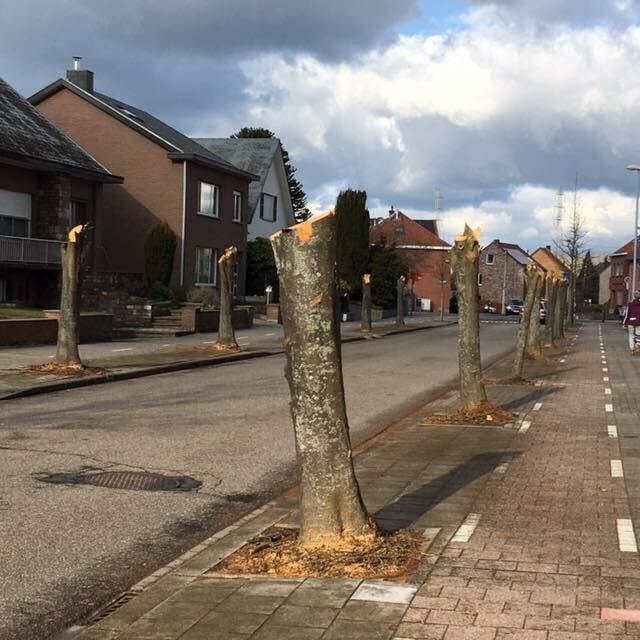 Suddenly many trees along the street were stripped of their heads. N-VA Leuven [the North Flemish Alliance, a conservative political party] is concerned about the felling of a large number of trees at Baron Descampslaan in Wijgmaal. According to councillors they were due for replacement. In the meantime, new plants are already being planted. So, the trees have been cut down because they were due for replacement, and indeed they are already being replaced. A look at Google Street View imagery from last summer shows that the trees had grown rather large for a narrow residential street, and there seems to be some damage to them as well. and if you literally turn around from your google maps spot you can see them in the process of being replaced. I don't really get what trees on a sidewalk have to do with 5g anyway. we have much bigger trees around me. and dont houses mess up cell phone towers more than anything? And i dont get my internet from a cell tower, is 5g only for cell phones? I dont see any "lines" in this neighborhood, so their electric and phone etc must be underground. ?? i cant beleive they would even replant trees knowing how much damage roots can do. a cool "roots" video. Just in case peopel can't visualize what "roots" means. Urban tree maintenance pruning removal and planting divides polarizes draws many opinions.. daily my role is to explain, negotiate, defend and/or/ address/calm public concerns. I had thought i'd heard all the reasons for or against tree removal-pruning or planting but trees interference with 5g network is a new claim I not come across.. I await the letters of concern to the City Arborist..
Urban tree maintenance pruning removal and planting divides polarizes draws many opinions.. daily my role is to explain, negotiate, defend and/or/ address/calm public concerns. Be grateful you don't work for Gateshead council's street lighting department who are being slandered and libelled daily by people who believe, having noticed all these new 5 GHz WiFi SSIDs with 5g in them, that the local authority's LED streetlights are actually part of a stealth 5G mobile trial beaming cancerous death rays into people's bedrooms. No bots. Just moderators enforcing the Posting Guidelines. It should be sufficient to follow the "No Click" guideline. Get an excerpt - the relevant part - from the target page and put it below the link, enclosed in the "external content" tag. See [´x´] button in the edit toolbar. Trees have been scientifically proven to interfere with the 5G Network. Having adjacent trees and or building at comparable heights to the mast can reduce coverage by as much as 70% in that direction, which is not in the interests of the operator, the local planning authorities and more importantly the mobile phone user. This is the source of many of today’s mobile coverage issues for consumers in many rural locations. "Could Obstacles Such as Trees Screw up Verizon’s 5G Hopes?" The mmWave technology has been criticized for its short propagation range and line-of-sight paths. Telstra is also funding research into whether uniquely Australian obstacles - including flora - will disrupt 5G signals, which occupy a higher frequency and don't travel as far as other mobile signals. "Something that seems to be unique to Australia, and we found with earlier standards, is how gumtrees impact those radio signals and the way they get from the radio tower to the end user," Mr Wright said. "New 5G phone system could face reception problems from trees with too many LEAVES"
A shock Government report into its launch says there are too many trees with lots of foliage. While rail services suffer from leaves on the line from autumn, the phone network faces problems from April to October — when trees are in full bloom. The rain menace depends on its location and intensity “across the range of droplet sizes”, adds the 142-page report. That's not being disputed here. What is being debunked is the claim that urban trees (and specifically the ones in the picture) are being removed because of that interference. That doesn't appear to be happening anywhere. Where trees are being cut down, they are being replaced with new trees. Many street trees planted in the past were unsuitable varieties, that grow too large for the street scene (as seen in the "before" photo above). So far this is the situation. The fact that trees interfere with 5G has been proven by numerous technical sources. What we need data on is the link between 5G trials and tree felling. thats a good point. as we drive down the street in 2009 we can see interspersed new trees. i think considering this is government and budgets matter, i'm ok with 'in the process of'. but i'm ok if you dont agree. we'll have to wait for the next google car to go through i guess and see if there are new little trees put up, or find someone on social media who can take pics for us at the end of the summer. Here is an important document. "5G Planning – geospatial considerations A guide for planners and local authorities" from the Department of Digital, Culture, Media and Sport/ Ordinance Survey (UK). Here is an important document. Nobody disputes that trees block 5G signals - just about any physical obstacle, including the walls of your house itself, will block the signals. What is being disputed is that trees are being cut down because of this. No councils that I am aware of have any policy of removing street trees because of 5G problems. If anyone has any evidence that such policies exist then they should share it, as you said yourself up thread. I did come across another claim of city tree removal for 5G event in Marseille France of 2018. It would seem it was a strong willed council landscape idea up against differing public feelings. And the tree removal was by some claimed due to 5G nework needs. The inhabitants do not digest the ongoing slaughter of 115 trees in the square. Gerard Chenoz, the elected LR who leads this violent renovation says regret the "emotional shock" and points to a "manipulation of the far left." i work for local gov tree dept and have contacts thought my state & country and have not yet had any claim of 5G network install to require impact to trees. this was an interesting stuff up, they actually put this pole in incorrect location. Once placed the $cost & project engineers embarrassment was formidable so i was compelled to prune some tree tops. Licencing of spectrum is controlled by Ofcom. It is assumed that solutions will be targeting mmwave technology for use in dense urban areas and radio technologies operating at frequencies in the 26GHz band. We anticipate Ofcom supporting the use of this frequency. Large and less dense coverage areas are likely to use lower frequencies being considered for 5G; 700MHz and 3.5GHZ. This document does not discuss planning for these. This document focuses on how the geo-spatial environment (man-made and natural) impacts the propagation of mmwave signals and what network planners and local authorities need to consider when planning a new network. It aims to provide a comprehensive approach to help assess the environment being considered for deployment, identifying which geo-spatial features are important to consider, how to identify them and, where new features need to be captured, which techniques and associated indicative costs may be involved to assist planners in budgeting. what does that have to do with the OP picture/street (my google map pic) and the fact we can see them replacing trees? It's essentially the same as what was posted in post number 12. Guidance that identifies obstacles that can block signals but are too small and/or not permanent enough to appear on large-scale mapping, and so must be additionally taken into account when planning 5G coverage, and added to maps if necessary. Nowhere in any of these documents does it suggest removing trees, and to the best of my knowledge no councils anywhere have a policy of removing street trees to facilitate 5G signals. If anyone can cite any such policy then this thread can be updated; as it is there is no evidence of anything other than normal street tree renewal.